A century before Meadow Stable, home of Hall of Famers Secretariat, Riva Ridge, Hill Prince and Cicada, put Doswell, Virginia on the racing map, Bullfield Stable in nearby Hanover County dominated the American racing scene. Its most famous son was a long-striding chestnut stallion named Planet, also called “the great red fox.” He was considered, after Lexington, the greatest racehorse up to the time of the Civil War. On August 10, the National Museum of Racing and Hall of Fame in Saratoga will induct Planet into the Hall of Fame in the historical category. Not only did this great champion and Bullfield Stable symbolize an era known as “the golden age of Virginia horse racing,” but they were an early influence on a horse-crazy boy named Christopher T. Chenery and the future Meadow Stable. Founded in 1824, Bullfield became known as “the Red Stable” because so many of its winners were sorrels and its jockeys wore flashy orange silks. Operated by Major Thomas Walker Doswell and his father, Bullfield gained renown as one of the most successful Thoroughbred farms of the East Coast. In fact, the locality of Doswell was named in their honor. Those limbs exhibited whirlwind speed against the top horses of the day such as Daniel Boone, Congaree, Hennie Farrow, Socks and Arthur Macon. Planet won 27 of 31 races and became the top money winner with nearly $70,000 in purses, a record that stood for 20 years. He possessed enormous stamina as well. Those were the days when horses raced in heats ranging from one to four miles, sometimes running as much as 12 miles in one afternoon. Such races would be unthinkable today, as would the practice of racing the horse again after only a three-day layoff, as Planet’s schedule occasionally dictated. However, the versatile Planet could win at any distance, long or short, posting some of his best performances at four mile heats. He carried Bullfield’s orange silks on familiar Virginia tracks at Ashland, Petersburg and Broad Rock and further afield on the Southern circuit from New Orleans, Mobile, Savannah, Charleston and even north to New York. Planet also displayed another form of versatility. He was an accomplished trotter who could do a mile in three minutes. According to John Hervey, this talent landed him in trouble at the New York track in 1860 where he was being worked at a flying trot before a meet. A race official ordered Planet and his rider off the track, declaring that trotters were not allowed. Other horsemen jumped to Planet’s defense, finally convincing the official to rescind his order against the champion Thoroughbred. Despite the handicap of war, Planet managed to sire impressive offspring who made turf history of their own. His blood figures in the pedigrees of Kingman, winner of the 1891 Kentucky Derby; Bowling Brook, winner of the 1895 Belmont Stakes; the great filly Regret who won the Kentucky Derby in 1915; Exterminator, winner of the 1918 Kentucky Derby; and (on the female side) Fleet Nasrullah, successful son of the legendary Nasrullah, the grandsire of Secretariat. Planet passed his trotting blood, which flowed from his sire Revenue, to his daughter Dame Winnie. She was bred to Electioneer, the great Standardbred, and produced the champion trotting stallion of his day, Palo Alto. 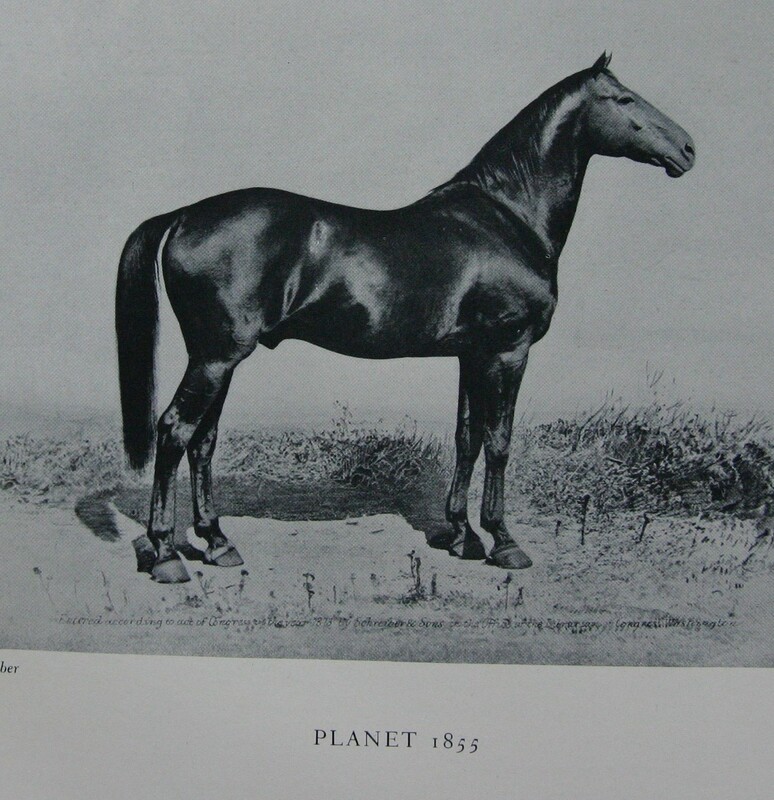 In the custom of the day, Planet’s portrait was painted by the famous equine artist Edward Troye, who at Major Doswell’s insistence, included Planet’s black jockey Jesse in the saddle. During a raid on Bullfield, the portrait was cut from its frame by Yankee soldiers. It was later found in a ditch and returned to the Doswells by someone who recognized the orange silks worn by Jesse. 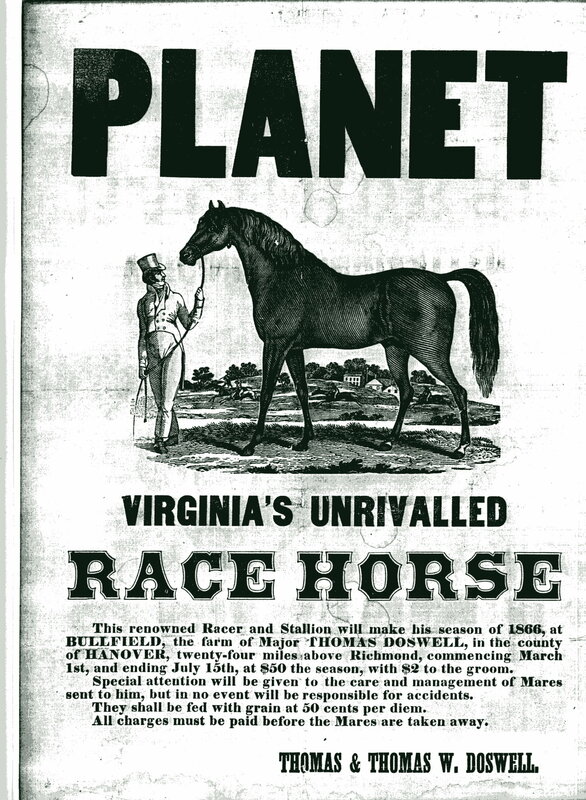 Major Doswell sold Planet to Mr. Alexander of Woodburn Farm in Kentucky, where he lived until his death in 1875 at the age of 20. 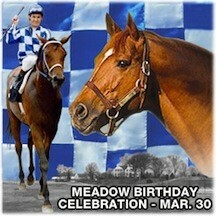 Planet and Bullfield influenced not only Thoroughbred history but also the history of Meadow Stable in neighboring Caroline County. After Major Doswell died in 1890, his son Bernard inherited a portion of the farm called Hilldene and ran his own small stable there. Bernard’s younger cousin by marriage, Christopher T. Chenery, would walk seven miles from Ashland to Bernard’s farm and exercise his few remaining horses on the old Bullfield track. Here, Bernard regaled Chris with tales of Bullfield’s glory days, introducing him to a heady world of gleaming trophies and fine-blooded Thoroughbreds, a world far removed from the boy’s humble circumstances in Ashland. Perhaps it is no small coincidence that when Chenery purchased The Meadow in 1936 and began building his foundation bloodlines, he named one of his most prolific mares Hildene. 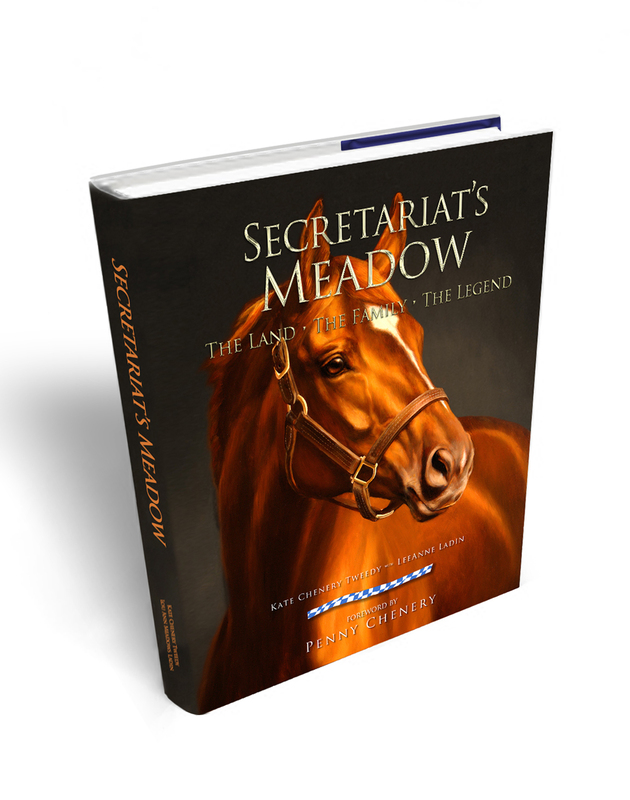 And, as everyone knows, The Meadow also produced a great red stallion, one who became Virginia’s and the nation’s “unrivalled racehorse.” Secretariat, “Big Red,” together with Planet, “the Great Red Fox” of Bullfield stand as pillars of equine perfection and performance, reminding the world that some of the most magnificent horses of the American turf sprang from Virginia soil. This entry was posted in Uncategorized and tagged Ashland, Caroline County, Chris Chenery, Doswell, horse racing, Meadow Stable, National Museum of Racing Hall of Fame, Planet, Riva Ridge, Saratoga, Secretariat, Secretariat's Meadow, The Meadow by admin. Bookmark the permalink. Those horses were magnificent. But, then what can we expect for such a great bloodline. They were gorgeous ,too. There will never,in my opinion be a greater racehorse then “BIG RED”. Hope to see you at HOF. Hope to see you too! Please come find me if I don’t see you.